Kaspersky Security Cloud for Mac runs a check for the security of your operating system settings. 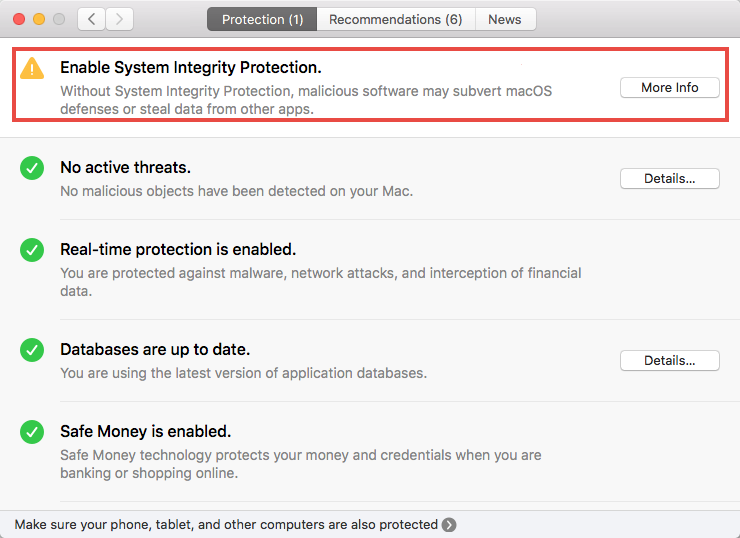 If it detects any settings that may put the protection of your Mac at risk, you will get a notification. 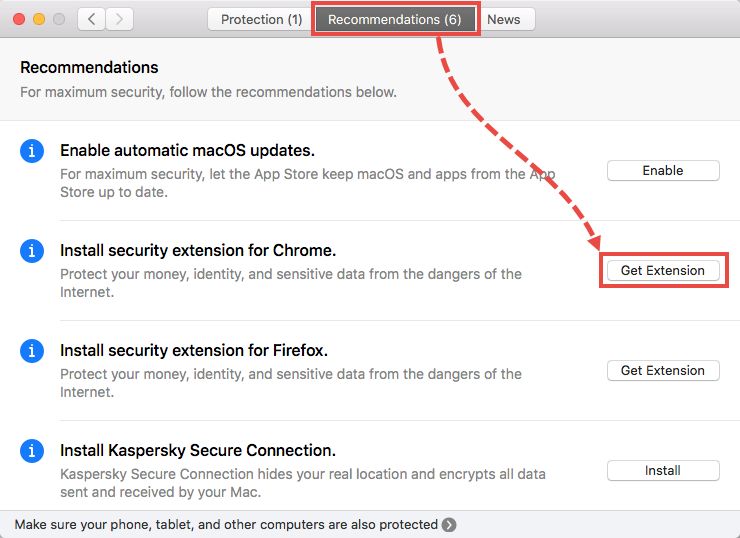 To view all detected vulnerabilities and recommendations on how to fix them, click the notification or click Open Protection Center in the main window of Kaspersky Security Cloud for Mac. 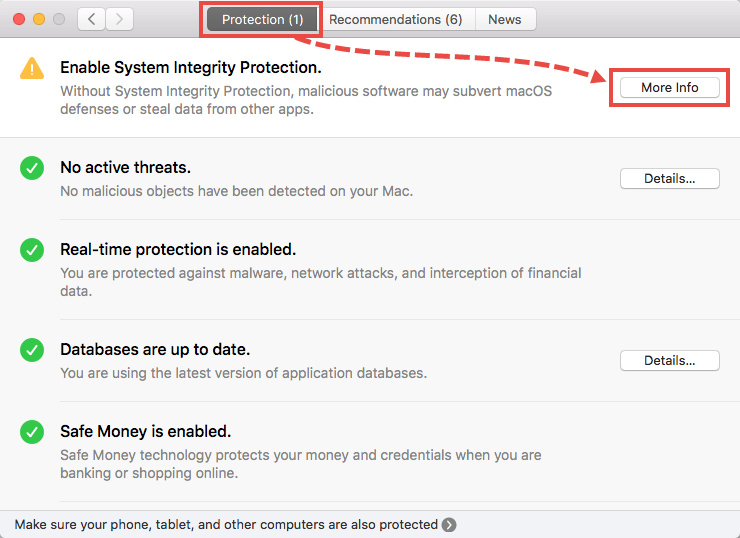 The suggestions are divided into recommendations and protection settings which are crucial for the security of your Mac. Recommendations are marked with the icon. Following the recommendations enhances the security of your Mac. Go to the Recommendations tab. Click the button on the right that corresponds to the recommendation. The recommendation has been implemented. Protection settings are marked with the icon. They must be fixed to eliminate protection vulnerabilities. Go to the Protection tab. Below you can find the guides on how to fix the most common operating system vulnerabilities. System Integrity Protection is a feature that protects the integrity of the operating system. If prevents malware from editing of system files and settings. Restart macOS in the recovery mode: press and hold ⌘+R on the keyboard during the system startup. In the upper-left corner of the screen, click Utilities → Terminal. System Integrity Protection has been enabled. Kernel Extension Development Mode disables the digital signature verification of drivers. This can lead to issues with the functioning of your computer, data loss, theft of confidential information and other problems. In the upper-left corner of the screen, click Go → Utilities. $ sudo nvram boot-args="debug=0x14e kdp_match_name=en3"
Kernel Extension Development Mode has been disabled. 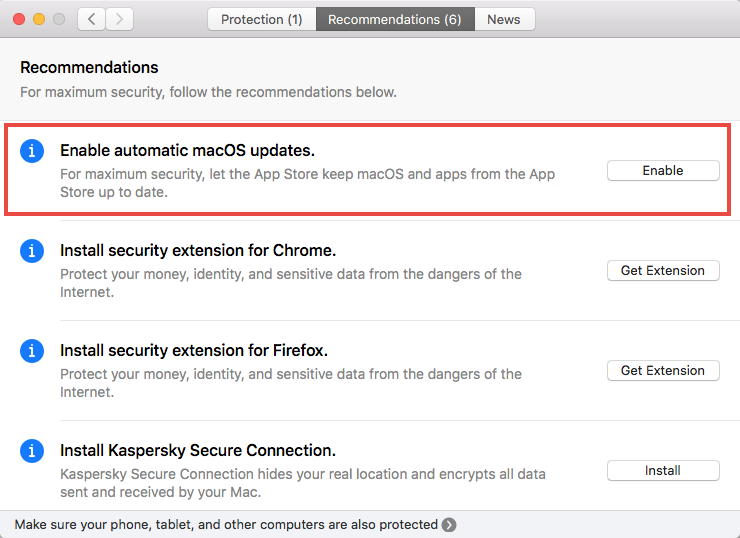 Updating macOS regularly enhances the security of your Mac. To enable automatic check for updates, click Enable.